Among other products, AccuQuilt offers Fabric Cutters and the dies that quilters want and need to make beautiful masterpieces. The cutters include the GO! Baby Fabric Cutter for the quilter that wants an inexpensive and portable way to cut smaller pieces for their projects, the GO! Fabric Cutter is for the quilter that wants a portable option with a larger selection of cutting dies, and last is the Studio Fabric Cutter for the avid quilter or retail store that wants a high end option that can cut more fabric, faster. Get More Valuable Discounts & Low Price, Save More With Coupon Code, Promo Code, Discount Code. Free Pattern of The Week! Free GO! Get $5 off GO! Dies Priced $29.99 To $49.99. $10 Off GO! 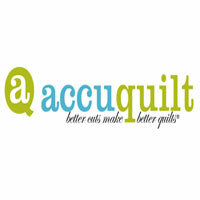 Dies $59.99 At accuquilt.com!